Over the last few days the sea ice has given us some of the highs and lows of the voyage. Antarctica has showed its treasures as we travel through the ice under a blue sky, with seals and penguins occasionally dotted on the sea ice. The photographers on board have been making the most of this photogenic scenery and charismatic wildlife (see our upcoming Q&A blog post). We are here at the end of summer and our hope was that the ice would be at its minimum extent, with open passages (or leads) for us to get through to the coast. In winter this isn’t an option as the sea ice is at its maximum extent. At that time, it nearly doubles the size of Antarctica – the largest annual change of any natural system on the planet. 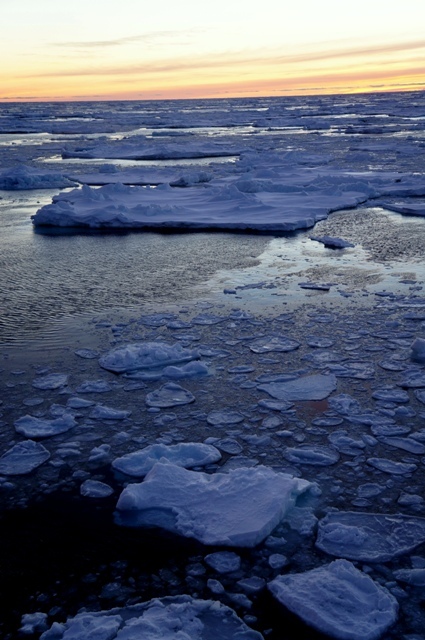 Sea ice forms from freezing sea water. Once thick enough, it insulates the ocean from the atmosphere. This limits the ocean to a chilling temperature of -1.9°C (it’s colder than fresh water because of the salt in the ocean), while the atmosphere above cools to -40°C or colder during winter. The first ice to form is frazil ice. These are individual crystals of ice that are only microns in size, but they grow rapidly and form into small discs, called pancake ice. The pancakes grow by waves splashing over them, and more water freezing onto the bottom. Eventually these grow together dampening out the waves that would break them apart. Once glued together the ice thickens to as much as 2 m for first-year ice near the coast, and around 0.5 -1 m out at the edge of the pack ice. 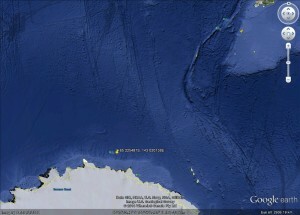 In winter the loose floes of the marginal ice zone (MIZ ) lie further north. Here the ice is unable to form a solid sheet, as the swell rolling in from the Southern Ocean bends and breaks the floes. As summer comes the ice starts to melt, mainly from underneath as the water warms faster than the air in the sun. The MIZ moves south, allowing the swell and the warming water to break and melt the rest of the pack ice. By the end of summer the MIZ has retreated significantly. Much of what is left is multi-year ice. Some is first-year ice, but if that lasts another month of summer it will become multi-year ice as well. The multi-year ice is thicker and more convoluted in shape, the result of wind, which pushes one floe over the top of another. This is then covered with snow, leaving the multi-year ice up to several metres thick. It’s the MIZ we had hoped to sail through to get in to the Mertz Polynya (see upcoming blog posts). On Saturday night, however, the captain announced that the ice was too bad. We won’t be going any further south unless the situation changes significantly. This was the low the sea ice delivered. We are unlikely to be working on the continental shelf this year. The ice has put plans A and B (see blog post 2) out the window. So we have moved to Plan C. This will focus on the continental slope looking for the outflow of heavy dense water which overflows from the continental shelf down the canyons (see future blog posts). The first discussion about Plan C was at 4 am. 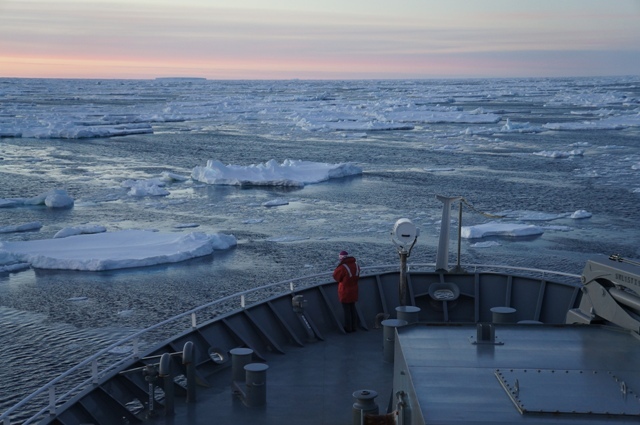 Now, in daylight a couple of days later, and with more satellite images of the current sea ice situation, we can see it is the best decision, particularly as we struggle to slowly move north at 1 knot, the ship shuddering as we push aside the ice floes. Also in amongst the first year and multi-year ice there are patches of pancake ice starting to form. We don’t want to get trapped. Better to be safe than sorry.